After a blowout loss at Virginia Tech and a long bus ride home, Pitt’s wrestling team returned to the friendly mats of the Fitzgerald Field House to try and make up for the loss. It did, in overwhelming fashion, two days later. On Sunday, the No. 13 Panthers (8-5, 2-2 ACC) shut out Clarion 51-0 in the team’s largest victory since 2010, when it defeated Millersville 53-0. The result stood in stark contrast to Friday’s road match at No. 9 Virginia Tech, when the home team won 26-10. “They had a long bus ride back from Blacksburg,” Pitt head coach Jason Peters said in a press release. In its first match at the Fitzgerald Field House since Jan. 11, Pitt won all 10 of the bouts against Clarion (1-15), pinning its opponents in seven of them. This was the fifth-largest victory in the history of Pitt’s wrestling program, and the second time it eclipsed 50 team points since the 1996-1997 season. With the team earning six points for a fall, rather than the typical three points for a standard victory, Pitt came close to reaching the maximum team point total for a match of 60. The only other time Pitt recorded more pins than it did on Sunday came during the 1983-84 season when it shut out Eastern Michigan 60-0, recording a pin in all 10 of its bouts. Freshman Dom Forys set the tone for the Panthers, pinning Hunter Jones in 1:42 in the opening 125-pound bout. Pitt’s first five wrestlers recorded pins, with the fastest coming in 59 seconds when No. 20 Mikey Racciato pinned Brodie Zacherl. No. 2 Max Thomusseit also pinned his opponent, extending his record to 22-1 on the season. He is also 13-0 in dual competitions, with the lone loss coming in a tournament. The closest the Golden Eagles came to a victory was in the last bout of the day, when Pitt’s Ryan Solomon recorded a one-point escape and defeated Clarion’s Joshua Davis 1-0 in the 285-pound match. The only other bout in which the visiting wrestler did not get pinned came when Pitt’s Troy Reaghard defeated Slade Horner 5-2. That win extended Pitt’s lead to 33-0 at the time. The match was a quick two-day turnaround from Friday, when the Panthers traveled to Blacksburg and lost to Virginia Tech. 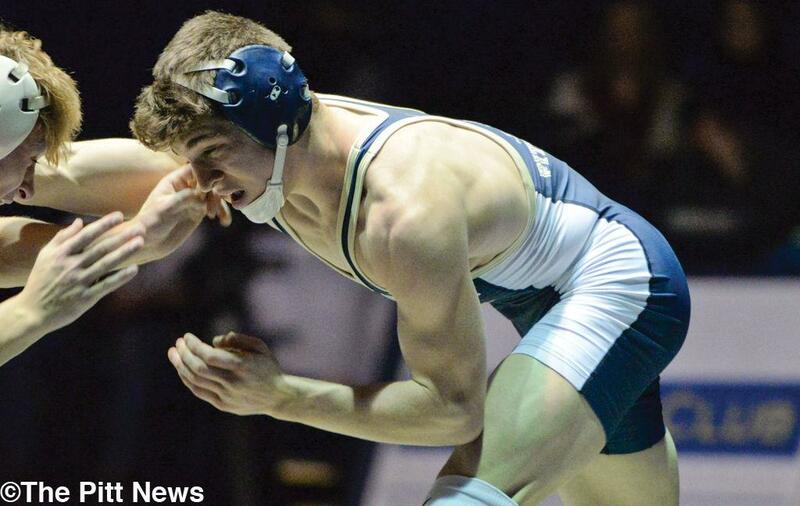 In five of those matches in the loss, Pitt wrestlers lost by two or less points. Pitt had won its first eight conference matches since moving into the ACC last year, but back-to-back losses at No. 14 Virginia and No. 9 Virginia Tech (11-2, 2-0 ACC) brought that streak to a grinding halt. On a night with 10 individually ranked wrestlers competing, Pitt lost to the Hokies in Blacksburg on Friday night, 26-10. Most of Pitt’s team points came when the match was already well out of hand. Virginia Tech jumped out to a 23-4 lead, with Pitt’s only victory in the first eight bouts coming when No. 2 Max Thomusseit beat Austin Gabel by major decision, 10-2. Pitt lost eight of the 10 matches, and the only other victory came when No. 20 Mikey Racciato pinned Brent Waterman of VT in 5:30. That was the second-to-last bout of the night, and the Hokies already had clinched the win. Pitt’s other ranked wrestler, No. 20 Nick Bonaccorsi, lost at 197 pounds 3-2. In the only bout of the night featuring two ranked wrestlers, No. 12 Zach Epperly of VT defeated No. 6 Tyler Wilps, 3-2. The result, coming early on in the match, extended the Hokies’ lead to 6-0. Wilps dropped to 9-3 on the year. The loss increased the team’s losing stint to three matches — its longest of the season — which it snapped on Sunday. The Panthers will finish their conference schedule on Feb. 14 at North Carolina State. The team still has two more non-conference matches before the ACC Championships in March — at Michigan, then hosting West Virginia at the Fitzgerald Field House on Feb. 22.